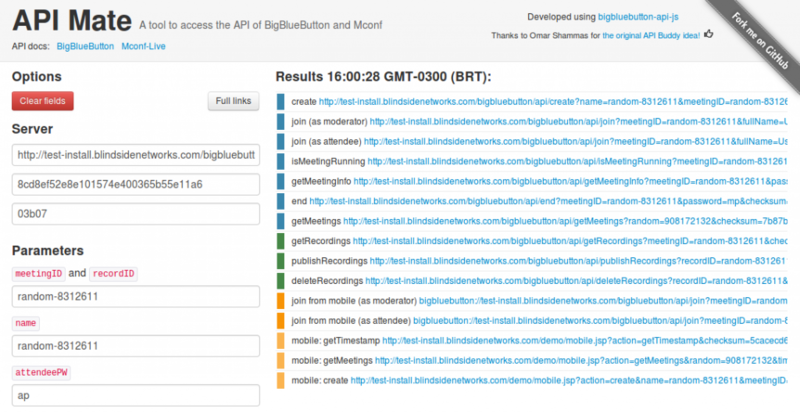 A few months ago we”ve made a post about the API Mate, a tool to access the APIs of BigBlueButton and Mconf. It was said that it was based on an open source library called bigbluebutton-api-js, and even tough the API Mate was free to use on our website, the source code was tightly integrated with the code of mconf.org and was not open source. Recently we”ve made a few improvements on its interface and released it as a separate open source project. You can still use it for free without needing to setup anything (see the links below), but now you can also make your own changes and adapt it to your casino pa natet needs. Feedbacks and comments (and pull requests!) are always welcome!